ADx is a decision support tool to screen adaptation options. Users are able to access several methods to select the most appropriate adaptation options for their site. Better understanding of adaptation options that can be prioritised in the site, as well as better understanding of the need to use more than one method to select them. 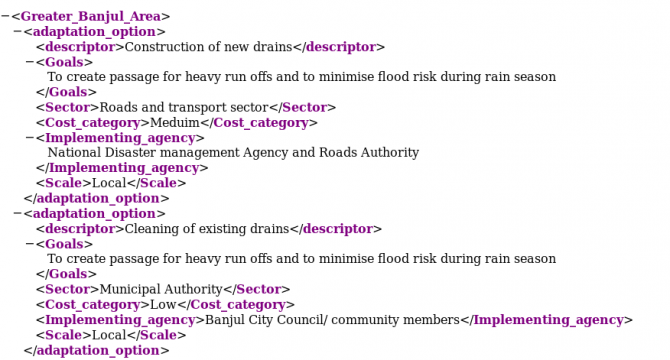 Greater Banjul area in The Gambia faces several climate related hazards including sea-level rise and high temperature stress which may exacerbate environmental problems. ENDA Tiers-Monde are working in this region to identify climate vulnerabilities and potential adaptation measures: initial pilot work was done in the Old Town of Banjul in 2009/2010 and further work is taking place as part of the C3D+ project in 2011/12. One component of this is ADx training. The picture above shows how a wetland in a pilot community (Ebo Town) is being encroached upon. Some inhabitants are trying to reclaim portions of the wetland by filling it up with solid waste. You can see a wall constructed showing the area which is being reclaimed. 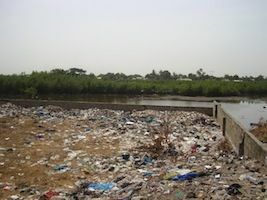 Apart from the fact that this can lead to serious flooding during the rainy season, the river and soil is being polluted by toxins from the solid waste. This training was carried out with ADx version 2.1 in July and August 2012. Construction of new drains and cleaning of existing ones to create passages for heavy run offs and to minimise flood risk during rainy seasons. This is to be coordinated by the Village and Ward Development Committees with funding and technical support to be solicited from government agencies (Municipal Authority, Roads Authority, National Disaster Management Agency etc.) and non-governmental organisations. Construction of concrete structures to reduce the incidence of structural collapse during flood events. Constructions should also be made at right locations and to conform to the acceptable standards. Halt encroachment on wetlands and cutting of mangrove vegetation. More mangroves can also be planted to protect shorelines and wetlands. The Village and Ward Development Committees are to lead the process with support of the Forestry Department and the National Environmental Agency. Provision of treated pipe borne water to community members as water from hand-dug wells is currently saline. In the second step, these options were formulated in terms of a set of attributes or characteristics. In the ADx training we ask participants to make an excel table that consists of a row for each adaptation option, and a column for each attribute. These attributes could be any relevant ones, but there is a set of common ones that we have found useful that includes: cost, scale, implementing agency, goal, sector. This step provides an opportunity to revisit and reflect on the initial list and/or to add or remove options. The final step is for the domain experts/training participants to produce a set of decision criteria. The attributes defined earlier may overlap to some extent with the criteria for decision-making (eg. cost). For the AHP method, which needs such criteria, we have added a way of entering (typing) criteria information directly into ADx. 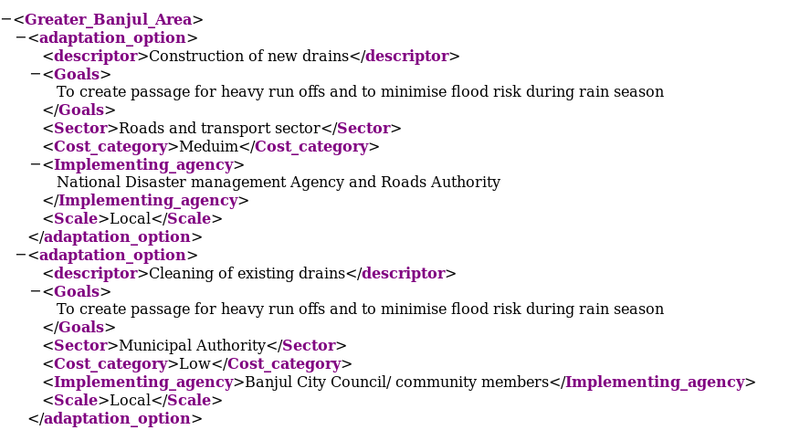 Therefore criteria do not need to be put into an XML file*, but they do need to be 'at hand'. * Eventually the aim is to have two sorts of input files that can be loaded into ADx, one containing options and descriptive attributes/categories, and one containing options and criteria for choosing. Having prepared this information, the participants will be ready to use the ADx! In this example, the two engines currently available in ADx are used: Voting and AHP. Guidance on how to select methods for adaptation decision making is an emerging area of research: see for example the Mediation project and the EU's CLIMATE-ADAPT portal. Please see the ADx User Guide page (or print the pdf which is also available) for further information. There are also 'tooltips' available when using the ADx software (which give hints on how to use different buttons, textfields etc below the mouse cursor). In this example, three participants took part, first in using the Voting method, and second, the AHP method. AHP also allows participants to select a subset of options. 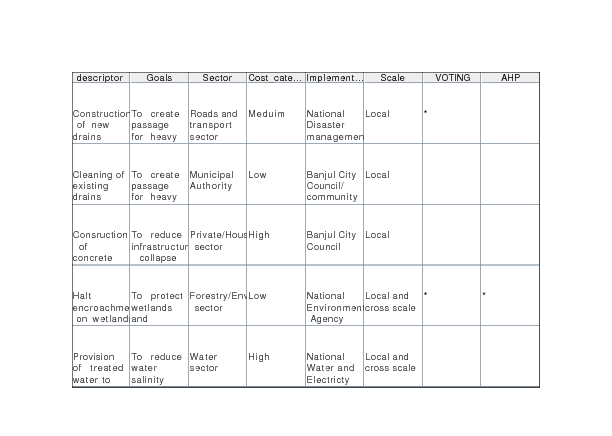 However, in this case all five adaptation options were part of the decision exploration. The image below shows the resuting printed output that can be obtained showing the combined results of the two decision methods used in this training example. The final section of the training session involves interpreting the results obtained from using the tool. The format used is short presentations explaining the options that emerged using each method (individually) and the actual envelope where a cluster of options overlapped (combined). The emerging preferred options will be indicated on the combined results screen, and any overlap (agreement among methods), or not, will also be indicated. The results in our example training session showed agreement in AHP and Voting on the option 4 'Halt encroachment on wetlands'. See below for an image of the final, combined results screen produced in the Banjul training session. Asterisks appear next to option 4 in both AHP and Voting columns. Particularly when there are different groups of training participants, some time can be spent looking at different results that the individuals and groups produced, and their points of agreement and disagreement on preferred options and most appropriate methods. Of course, it is important to remember that the point of the tool is not to advocate any one particular method and not to design a comprehensive decision making model. However, it will show the value of using a range of methods and demonstrate what this can help us understand about different options in a given vulnerability context.